Use of arrow keys when focused on the Google language option field will translate site content on the fly. Use your enter key to review all options and choose your selection before applying. For young people with disabilities, the transition from high school to work can be very challenging. The Transition Program works with students and parents to develop and implement a plan for their child to achieve success and independence after their Overbrook years. The Transition Program is designed to be a results-oriented process which promotes movement from school to post-school activities including post-secondary education, vocational training, integrated employment (including supported employment), continuing and adult education, adult services, independent living or community participation. Work opportunities, which may be on-campus as well as off-campus, help to provide a realistic view of the strengths and weaknesses of each individual. In the White Hall Independent Program, students learn the basics of living in an apartment and develop skills such as cooking, cleaning, budgeting, leisure activities, and personal care. Also, students learn how to live with a roommate and the social skills necessary to enjoy a work-life balance. You can learn more the White Hall Independent Living Program here. OSB students actually begin the process of planning for their futures starting in the Middle School program. As they progress through their academic career, some students take an interest in attending college. The teachers, specialist, and other team members help support that student as they research requirements for college and what course of study they are interested in. The students are encouraged to take a tour of a local community college as well as the entrance exam to see if college would be the best fit for them. Students also have the opportunity to enroll in college and start taking college classes while they are attending our school. Their teachers support them in identifying what accommodations they need for their class as well as how to finish assignments on time and organize their class schedule. The goal is to make sure the student is prepared for college and is able to advocate for their needs in a different learning environment. Through classroom instruction, students learn independent living skills. 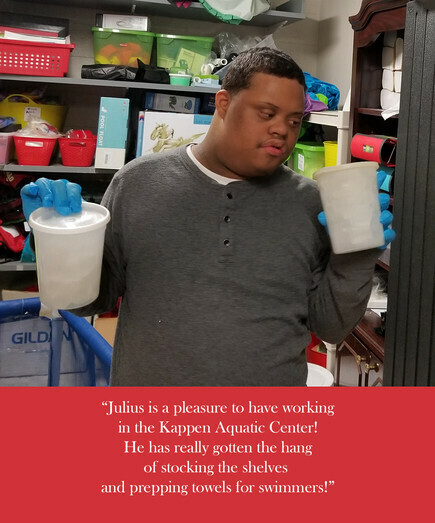 During living skills and apartment living classes, the students get to practice how to manage a budget, meal plan, clean a home and take care of their clothing. They have an opportunity to apply the skills they learned while living in the Whitehall Independent Living Program, which is an overnight program for students to attend Monday through Friday. Each week, small groups of students go out into the community to purchase food to cook during their weekly cooking class. They also go to wholesale stores to purchase items to sell at the Apartment Living student-run cafe on campus. Around the holidays and in the spring, students can spend their hard earned money during class trips to the mall or to the dollar store to buy gifts for friends, family and themselves. Technology is a useful way for students to access information in the classroom and the community. Students receive instruction in utilizing technology ranging from communication devices to iPads. Students can use their personal devices to take notes, organize their schedules, send emails and access information in print. In the classroom, students use computers with adaptive keyboards and software that will enlarge text or read what was is on the screen. OSB has a relationship with Art Reach, an organization based in Philadelphia that focuses on making the arts accessible to those with disabilities. The students have the opportunity to go to different museums where the artwork has been made accessible for them to touch, and they have the opportunity to make their own artwork. During the 2017-2018 school year, a select group of students participated in a dance program with the Pennsylvania Ballet. Five students worked with professional dancers from the Ballet and learned a tap dance routine which they performed at the end of their three-month learning experience. The students not only learned how to dance but made friends with their peers from the PA Ballet! Collaboration is required in order for a student to have a successful transition from school to school, college, or work, and each student plays an important role in planning their transition and are included throughout the process. Are you looking for a few good workers? Partner with Overbrook School for the Blind to find your next dream employee. Competent and motivated entry-level job seekers, all of whom are either blind or visually impaired, are ready to contribute to your business - at no cost to you! Overbrook School for the Blind student workers (ages 16 to 21) are paid by a stipend from the school. Rigorously trained with excellent customer service skills, these student workers are transported to the workplace by school staff for a prompt arrival. No more late-to-work excuses! Set a standard of inclusion and accessibility in the workplace for others to model by hiring an Overbrook School for the Blind student. Find out more! © 2019 Overbrook School for the Blind. All Rights Reserved.